says reviewer Curtis Lynch of Playgrounds Magazine in Columbus, GA. And a ride it is, one you'll never forget, complete with goosechills and thrills. Their songs, vignettes and snapshots in time, blend numerous styles into their own inimitable sound. A "charismatic, spine-tingling american acoustic rock band"! Here to awaken your soul. 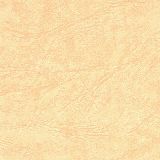 Radar Rose's latest release Click should be the one to turn the tumblers of that lock called National Attention. Cosmic Americana Rock is what they call it. Fellow divas Jane Gabrielle and Anastasia Mooney swap turns on vocals sultry as a September afternoon in Savannah. Sax man extraordinaire Don Clfiton, the latest addition since their live CD recording (at The Coffee Pot in their Roanoke hometown), also shows promise as a fine producer. Bass man and founding father Sonny Campbell says, "Don't really loosened me up, opened me up to listening to things differently." Campbell also provides very tasty harmonies to the ladies' lyrical licks. Drummer Mike Balkom keeps the band rhythmnically correct and really shines on "We Were Young (Joe)," my personal selection for first single. As for my second and third choices, they're ALL good! Click was recorded in Richmond at The Sound of Music studios. "Mike turned us on that place...that room made the drums sound huge!" says Jane, founding mother of this eastcoast touring act. Wheter at a live show or on CD, Jane wails! She delivers each song with the right amount of tender to snarling raw emotion each song demands; "Shrinking Violet" (over some cool violin grooves from guest Mike Mitchell), "Something About You," "Croozin'," featuring Jane and her mom Phyllis Hicks in an introductory dialogue reminding us that "everything you truly need you can fit in the trunk of your cat." "This Child is a Bridge." and "Don't Touch That Love." In addition to lead guitar and some ultra-fine fluting, Anastasia brings original tunes to the party with "Tohrow Open the Window" and "Pick It Up along with a provocative exercise in breath control on "Climb." Anastasia's vocals are so sensuously smoldering, I swear there was smoke comin' off the CD deck! "We Were Young (Joe)" should be on a movie soundtrack. It has anthem written all over it. The album closes with "Bright Star," a sweet Jane & Sonny ballad that is reminiscent of the Eagles Seven Bridges Road. It's been said through the ages to "Leave 'em wanting more." 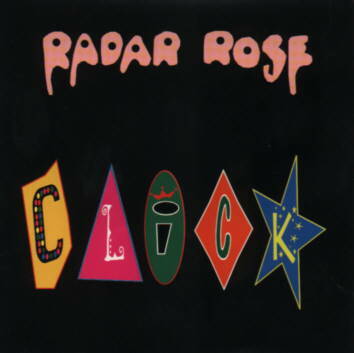 Radar Rose's Click does just that. You'll find yourself clicking back through frequently! Click can be found at all Record Exchange locations, Safe as Milk Records (Roanoke), off their websit, or at one of their unforgettable live shows. "...The group's gift for smoothly blending parts with the beautiful deepsoul of Anastasia Mooney's flute and Don Clifton's say set it miles apart and above your average band on the rise." 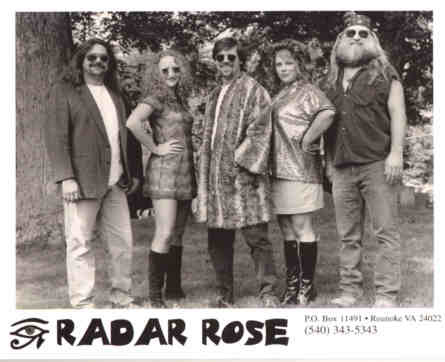 "If you enjoy Melissa Etheridge, the Indigo Girls and Disappear Fear, then this band will undoubtedly be of interest"
"Radar Rose's first full length studio CD "CLICK" sure does CLICK. All ten songs are winners. Climb is already receiving airplay along with half the other tracks. Something About You is "1 song of the year."